The Israeli government and its allies are mobilising to try and thwart a United Nations list of companies complicit in illegal settlements in the occupied Palestinian territory (oPt). These efforts are taking place in parallel to significant initiatives by figures within and outside of the Israeli government to normalise the presence of the settlements, moves which could contribute towards a future, formal annexation of sections of the West Bank. On 24 March 2016 the UN Human Rights Council (UNHRC) adopted a resolution by 32 votes to 0 (with 15 abstentions) that called for the establishment of “a database of all business enterprises involved” in settlement activities in the occupied Palestinian territory (oPt), to be updated annually. While some saw the vote as “a symbolic victory for the Palestinians,” others went further, hailing it a “landmark decision” after “years of toothless UN condemnations of settlements”. The Boycott Divestment and Sanctions (BDS) Movement praised the resolution for affirming that “companies must be held to account for their participation in Israeli violations”. In the past 18 months, preparatory work has moved ahead, albeit with delays. According to Fox News, in December 2016, the UN allocated $138,700 for the work required to establish the list. While the original publication date in February 2017 was put back, it now appearsthat UN human rights chief Zeid Ra’ad Al-Hussein intends to publish the list by the end of the year. The database was fiercely opposed from the very beginning by the Israeli and US governments. In the weeks before the March 2016 vote, both made “intense diplomatic efforts” to block the resolution, with Israeli ambassadors “instructed to convey to the highest echelons” of their respective capitals that Israel wanted Council members “to oppose the resolution”. But what explained Israel’s unusually intense level of mobilisation – or its depth of anger at the resolution’s adoption (government spokesperson Emmanuel Nahshon said the UNHRC was “in need of urgent mental treatment”)? As the Financial Times explained, Israel and the US “fought against the database provision for fear it would lead to pressure to boycott the companies in question”. An op-ed in Israeli newspaper Yedioth Ahronoth was clearer about the threat. In contrast to “the hundreds of other anti-Israeli resolutions” the UNHRC has passed “which didn’t change a thing,” the piece argued, the database would be “likely to cause serious trouble”. Why? The “list of Israeli companies working in the settlements is long and includes most of the business sector”. Israel and the US have been trying to stymy the creation of the database ever since, with the two states unsuccessfully opposing the release of UN funding for the work. In June, US ambassador to the UN, Nikki Haley, blasted the database as the latest in a “long line of shameful actions” by the UNHRC, and suggested the Trump administration may even withdraw from the Council altogether. On 21 August The Washington Post reported on US lobbying efforts to thwart the publication of the database, with unnamed diplomats painting a picture of “behind-the-scenes jockeying over the issue”. A senior US official quoted by the paper explained that the Trump administration is seeking to look for the list of companies to be implemented “in the most narrow way possible” – if at all. Later that same month the Israeli media reported that Benjamin Netanyahu’s government and the US were ramping up the pressure to try and block the UN list of companies. From the Israeli government side, the panic and lobbying efforts stem from a perception of the publication of the list as a significant win for the BDS movement. The Israeli authorities have been aided in their offensive against the database by NGO Monitor, an outfit that has been described as a “government surrogate group”. In June, the organisation launched a document which, it claims, “reveals that business activity in occupied territories [around the world] is ubiquitous,” citing the likes of Northern Cyprus, Crimea, and Western Sahara. The report, authored by Northwestern University professor Eugene Kontorovich, claims both that international law does not prohibit businesses from operating in occupied territories, and, that the UNHRC is singling out Israel for opprobrium. That is to say, NGO Monitor seeks consistency of impunity, not consistency of accountability. The purpose of the report, according to Kontorovich, is “to name and shame… the Council for engaging in this effort, the countries that supported this effort, and any countries that might think of continuing to fund it or I would even say continuing to sit in the Council as they go down this one-sided path”. In other words, a glossy, 44-page-long trolling exercise. Kontorovich, for his part, is as enthusiastic a supporter of Israel’s settlements in the oPt as he is an opponent of efforts to seek accountability for violations of international law. In recent weeks he has defended a marathon which winds through the West Bank, and, as an expert at “conservative think tank” Kohelet Policy Forum, attacked a Human Rights Watch report on settlements and Israeli banks. Indeed, the Ukrainian-born, US-raised academic has himself lived in at least two West Bank settlements since emigrating (Alon Shvut and Neve Daniel). 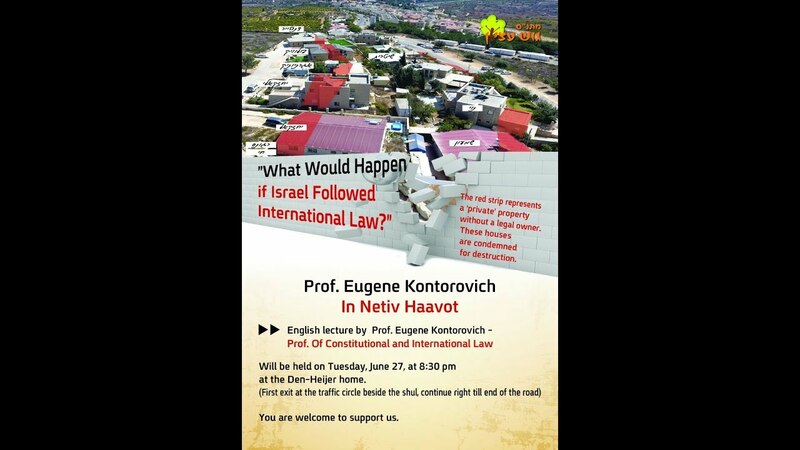 Earlier this year, Kontorovich gave a guest talk (video) at Netiv Ha’avot, a settlement outpost facing the prospect of house demolitions. A few years ago, he similarly addressed radical settlers at a site in the southern West Bank. As Israel has sought to shield itself – and complicit parties – from accountability abroad for systematic violations of international law, at home influential political forces within and outside of government are looking to normalise the presence of settlements in the oPt, a possible precursor to formal annexation. Responding to a petition against the recent bill retroactively authorising settler homes built on privately-owned Palestinian land, the Israeli government has submitted to the Supreme Court what has been called “one of its more forceful documents to date,” a legal brief “pushing to change the legal interpretation underpinning 50 years of its judicial treatment of Area C of the West Bank”. If, as The Jerusalem Post reported, the court accepts the argument laid out in the brief, “it will have taken a significant step in the normalisation of Israeli life for the 400,000 citizens who live in Area C, which is outside the country’s sovereign borders, instead of viewing it as belligerent occupation”. Interestingly, the government’s brief was authored by a private attorney, Harel Arnon, after the Attorney General refused to argue the state’s position. Arnon is listed as a ‘Legal Advisor’ to ‘We Have Legal Grounds!’ (along, incidentally, with Kontorovich), a lobby group seeking the Israeli government’s adoption of the 2012, pro-settlement Levy Report. Interestingly, these initiatives are occurring at the same time as anti-BDS legislation is being vigorously promoted in the United States, an opportunity some are seizing to erase any distinction between Israel and settlements in the oPt (see a number of state-level anti-BDS laws, for example). In a recent op-ed in The Washington Post, meanwhile, Jonathan Greenblatt, head of Anti-Defamation League, defended the Anti-Israel Boycott Act currently being debated on Capitol Hill by explicitly referring to – and tellingly misrepresenting – the UNHRC database. Indeed, one pro-Israel publication claimed that the very “impetus” for the legislation was the UNHRC resolution. It is instructive to note how these developments – Israel’s international offensive against the UN database and domestic efforts to normalise, legally and discursively, settlements in the oPt – are happening in parallel. Remember, it is only because of a lack of accountability that Israel’s de-facto annexation of the oPt has been able to proceed over the last half century. It is because of this ongoing impunity that influential political currents within and outside the Israeli government see an opportunity, as they see it, to normalise the presence of illegal settlements, unilaterally carve out the contours of Palestinian reservations, and annex ‘Area C’ of the West Bank. To understand the kind of end goal these people have in mind, we can go back to Kontorovich, and specifically, to an interview he gave in 2013. Asked what the solution is to the Israeli-Palestinian conflict, Kontorovich didn’t hesitate: “The status quo”. In this context it is vital the UN database comes to fruition. By itself, it is a drop in the ocean. But if such a modest gesture towards accountability was undermined by Israeli and US pressure this would serve as yet further encouragement for those Israelis – some of whom are in government – who believe that the status quo, namely a de facto, apartheid one state, is all too sustainable.